Sami national day has been celebrated by indigenous people across Norway, Sweden, Finland and Russia on February 6 since the Sami Conference adopted the date in 1992. The day was chosen to commemorate the first international Sami congress in Trondheim in 1917, but debate remains over what the day should actually be called. Directly translated into Norwegian, the term sámi álbmotbeaivi becomes samefolkets dag or samenes folkedag, which means Sami people’s day. 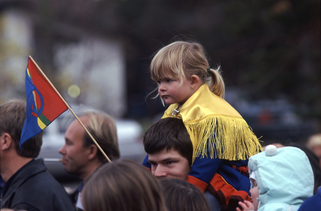 The 1992 Sami conference, however, referred to the celebration as Sami national day, which has stirred some controversy, reports Norwegian Broadcasting (NRK). It marks the 1917 congress, which was the first time Sami people from various countries had gathered in a large meeting to discuss common issues and problems. The Sami parliament passed a resolution about 10 years ago, with the majority settling on the term “national day.” The Norwegian Sami parliament made the decision in line with the terminology used by the 1992 congress and by Sweden and Finland. Certain days in Norway are deemed to be national flag days, when both state agencies and private people can hoist the Norwegian flag. In 2003 the Sami national day was added to the list. It’s optional for departments to fly the Sami colours of green, blue, red and yellow (which signify the four countries where Sami live and the elements of plants, water, fire and the sun) alongside the Norwegian flag. 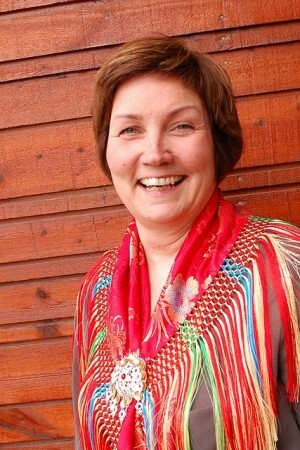 Heidi Persdatter Greiner Haaker is the first deputy to the Sami parliament. She has worked to promote Sami culture in her municipality of Sørum, in the Akershus area around Oslo. She said it’s a shame only four of the 22 municipalities in Akershus fly the Sami flag. “It has meant so much to us if municipalities managed to buy a Sami flag and let it wave in the wind,” she said. “It makes you feel a little proud to be a Sami.” She said it’s a sign communities regard Sami culture as equally valuable. NRK contacted several municipalities, which said they didn’t own a Sami flag, the Sami flag they had was too small, or that flying the Norwegian flag is for everyone in Norway. Meanwhile, language experts warn many of the Sami dialects are in danger of dying out. About a century ago, communities around Troms and Finnmark spoke Norwegian, Finnish and a Sami language. That’s no longer the case, partly because of “Norwegianization,” reported newspaper Aftenposten. Sami languages are strongly linked to the use of resources, with many different words to precisely describe types of snow, or different reindeer characteristics. Many of the Sami words for fishing and farming in coastal communities have disappeared because of strict Norwegianization in those areas. There has been a resurgence in the preservation of Southern Sami, spoken by about 600 people in Norway and Sweden. In Sweden, just 10 people still speak Ume Sami and 30 to 50 people speak Pite Sami. About 1000 speak Lule in Norway and Sweden. Northern Sami is the main Sami language, spoken by up to 25,000 people from Norway to Finland. About 500 people in Finland and Russia still speak East Sami. NRK worked with Sami people in Karasjok to create a music video (external link, in Norwegian) commemorating this year’s national day, featuring Sami language and clothing.